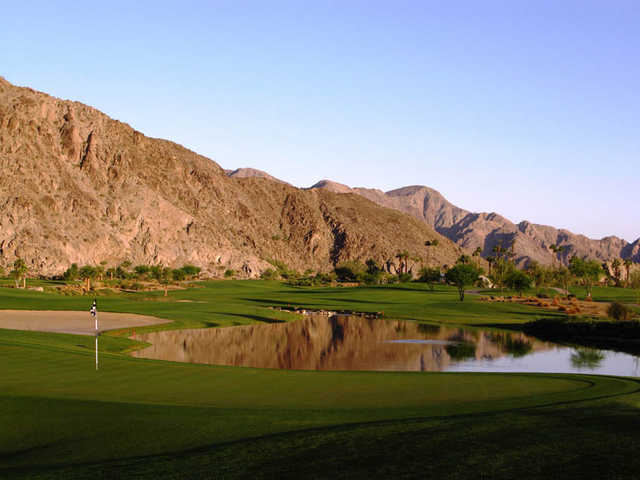 SilverRock Resort is the city of La Quinta's first municipal golf course. 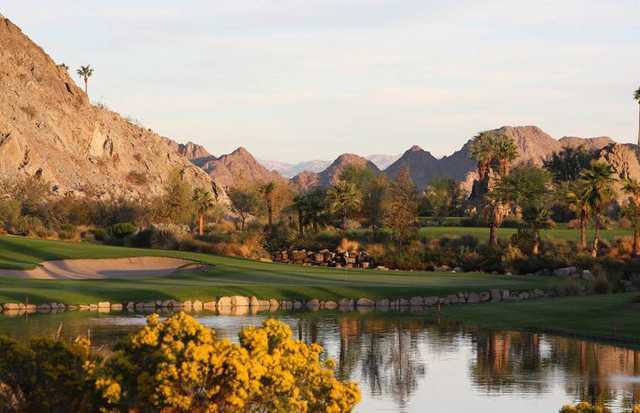 This Arnold Palmer Classic Course is the home course of the Bob Hope Classic. 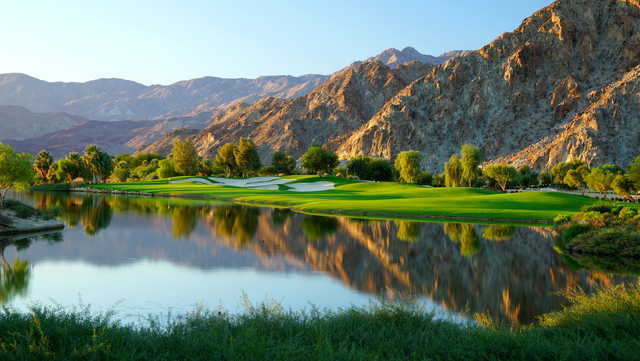 At 7,578 yards, it is the longest course in Palm Springs and one of the longest courses on the PGA Tour. 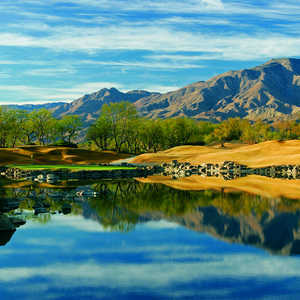 SilverRock sits right at the base of the Santa Rosa and Coral Mountains, which provide a stunning backdrop for every hole. It is closer to the mountains than any other public golf course in the area. The rugged landscape provides rocky outcroppings and massive native bunkers to contend with throughout the course. Beautiful water features also come into play on several holes. The SilverRock layout is challenging but the widths of the fairways are fair and playable and the holes are diverse enough to appeal to a range of different skill levels. Dress code: Proper golf attire must be worn at all times. Shirts and shoes must be worn at all times. Men's shirts must have collars and sleeves. By far the best course i ever played.extremenly challengling and fair at same time.very picturest and extremely well manicured. Called for tee time and pro quoted one fee, but when I got to course the charge was $10 more per person. The guy at the pro shop had no idea what he was doing and the lady, who also worked at the pro shop, was rude and nasty. I ended up paying the extra money. The greens are in bad shape, looks like they get a lot of play but little maintenance. Pretty course but there are definite management and customer service issues. This is by far the nicest golf course I have ever played at. Played during the summer and the best part was that it was only 75 buck for me and my dad combined with cart (I got a 25 dollar junior rate for a 7 AM tee time). As soon as you pull into the gorgeous sanctuary you are reeled in and you are immediately enlightened. You start seeing the course and you know that you are going to be in for an outstanding fun day. As soon as you pull up there are people there to take your bag and get it set up on a cart for you. Once you check in you are encouraged to hit complementary range balls on a scenic in itself driving range with perfect grass driving areas. One nice thing with it being so hot on the golf course is that you get a ice filled cooler containing several bottles of water. There are also people that come around with refreshing cold wet towels that are great to put around your neck to cool you down. Every hole is an extremely scenic and could be a signature hole at almost any golf course in the United States. There are holes were you are hitting right at the mountain were you almost feel like you are going to hit it. The course is long and challenging at time, but it leaves room for mistake as it is very unlikey for one to loose a ball. I played from the blue tees and was astounded to find myself shoot in the mid 70s. You are in such an awe the entire time that it is impossible to be frustrated and anything but joyful. I would recommend this course to anyone who wants to have the best time in their life and one of the most memorable moments they will ever have. I can only imagine what this course is like at peak demand time. Thanks SilverRock for this amazing experience. This is a Palmer course that you will not soon forget. 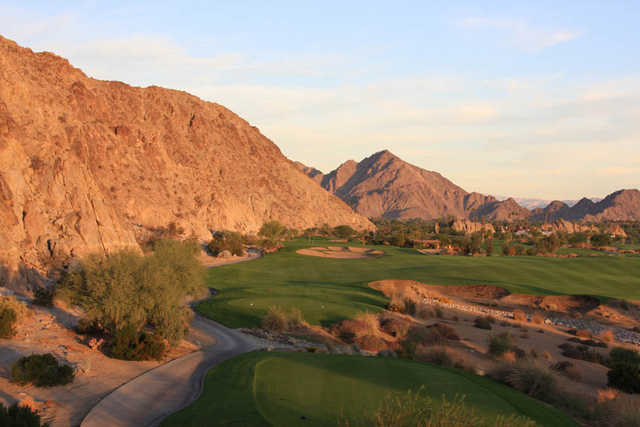 A reletively new course owned by the city of La Quinta, and just down the road from PGA West. This course is set to challenge your best day of golf. The course is maintained to the tens. Lots of sand and water, plenty of twists and turns. I don't know how you could have any more fun without removing your knickers. We will return.